Died c. 488. Saint Maughold was an Irish prince and reputedly a captain of robbers who was converted by Patrick. Upon his conversion, he became a new man by putting on the spirit of Christ. One version of the legend says that Patrick told him to put to sea in a coracle without oars as a penance for his evil deeds. Another says that he set sail in order to avoid the temptations of the world. In both stories, he retired to the Isle of Man (Eubonia) off the coast of Lancashire, England. Earlier Patrick had sent his nephew, Saint Germanus, as bishop to plant the Church on the island. Germanus was succeeded by Saints Romulus and Conindrus during whose time Maughold arrived on the island and began to live an austere, penitential life in the mountainous area now named after him Saint Maughold. After their deaths, Maughold was unanimously chosen as bishop by the Manks. In one of the 18 parish churchyards on the island can be found Saint Maughold’s well. The very clear water of the well is received in a large stone coffin. Those seeking cures of various ailments, particularly poisoning, are seated in the saint’s chair just above the well and given a glass of well-water to drink. Maughold’s shrine was here until the relics were scattered during the Reformation. Saint Maughold (Macaille, Maccaldus, Machalus, Machaoi, Machella, Maghor, Mawgan, Maccul, Macc Cuill) of Man (died ca. 488 AD) is venerated as the patron saint of the Isle of Man. Tradition states that he was an Irish prince and captain of a band of freebooters who was converted to Christianity by Saint Patrick. His feast day is April 25. He is not St MacCaille of Croghan, County Offaly, who received Brigit of Kildare into religious life. One local legend relates that Maughold tried to make a fool out of Patrick. Maughold had, according to this story, placed a living man in a shroud. He then called for Patrick to try to revive the allegedly dead man. Patrick came, placed a hand on the shroud, and left. When Maughold and his friends opened the shroud, they found the man had died in the interim. One of Maughold’s friends, a fellow named Connor, went over to Patrick’s camp and apologized to him. Patrick returned and baptized all of the men assembled. He then blessed the man who had died, who immediately returned to life, and was also baptized. Patrick then criticized Maughold, saying he should have been helping his men into leading good lives, and told him he must make up for his evil. One story says that he retired to the Isle of Man to avoid worldly temptation. Another account relates that as penance for his previous crimes, Patrick ordered him to abandon himself to God in a wicker boat without oars. Maughold drifted to this isle, where two of Patrick’s disciples, Romulus and Conindrus (Romuil and Conindri), were already established. 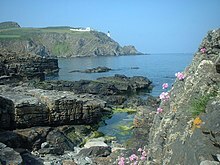 Tradition says he landed on the north-east corner of the Isle near Ramsey, at the foot of a headland since called Maughold Head, where he established himself in a cave on the mountain side. He is said to have been chosen by the Manx people to succeed Romuil and Conindri as bishop. ^ Saint of the Day, April 27: Maughold of Man Retrieved 2012-03-02. Born 954; died 1012; also called Godwine, martyred Archbishop of Canterbury, left his widowed mother and patrimony for the monastery of Deerhurst (Gloucestershire). After some years as an anchorite at Bath, he there became abbot, and (19 Oct., 984) was made Bishop of Winchester. that of his translation on the 8th of June. He is sometimes represented with an axe cleaving his skull. The Glamorganshire Cross. 2015. The Glamorganshire Cross. [ONLINE] Available at: http://www.thecrypt.net/celts/Glamorganshire.html. [Accessed 28 December 2015]. Celtic and Old English Saints – 28 December . 2015. Celtic and Old English Saints – 28 December . [ONLINE] Available at: http://celticsaints.org/2015/1228a.html. [Accessed 28 December 2015]. Celtic and Old English Saints – 28 December . 2015. Celtic and Old English Saints – 28 December . [ONLINE] Available at: http://celticsaints.org/2015/1228b.html. [Accessed 28 December 2015]. St. Romulus and Conindrus – Saints & Angels – Catholic Online. 2015. St. Romulus and Conindrus – Saints & Angels – Catholic Online. [ONLINE] Available at: http://www.catholic.org/saints/saint.php?saint_id=4641. [Accessed 28 December 2015]. Celtic and Old English Saints – 28 December . 2015. Celtic and Old English Saints – 28 December . [ONLINE] Available at: http://celticsaints.org/2015/1228d.html. [Accessed 28 December 2015].